GEM develops powerful toolkits to address complex engineering issues. XFA3D is a toolkit for simulation of mesh-independent 3D fatigue crack growth based on XFEM technology and Abaqus/Standard solver. The toolkit was developed under the sponsorship of US Air Force and Office of Naval Research. Under the ongoing support from US Navy, a close collaboration between GEM and Navy Lab (NSWCCD) has been established. A trail version of XFA3D is being tested by users at NSWCCD. Three methods can be used to insert an arbitrary crack into an existing Abaqus model without a crack: 1) use of a cutting plane; 2) use of sketch for the crack part; and 3) use of an existing orphan mesh. Multiple cracks can be inserted via the customized CAE with the cutting plane option as shown below. An Abaqus style keyword interface has been implemented in XFA3D for defining analysis models and options. 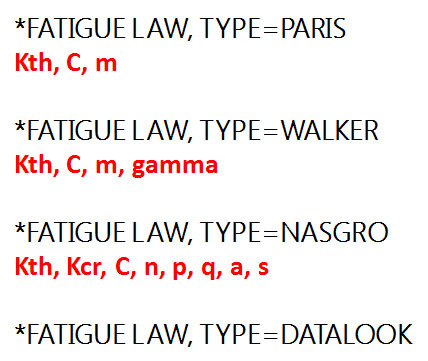 An example input for invoking a fatigue crack growth law is shown on the left through the keyword input. The workflow of the application for solving a 3D crack growth problem is demonstrated using the fatigue crack growth in a helicopter component [Round-Robin Fatigue Life Prediction under Spectrum Loading, J. C. NEWMAN Jr., P. E. IRVING, J. LIN and D. D. LE, Crack growth predictions in a complex helicopter component under spectrum loading, Fatigue Fract Engng Mater Struct 29, 949–958]. An XFEM zone that covers both an initial flaw and its potential growth is defined via the user-defined elements. A cracked plane with a sketch of the crack front is employed to define the initial quarterly circular crack. After the execution of XFA3D, the results files can be used to plot the a(N) and K(a) curves as shown in the figure. ©2010-2019 Global Engineering & Materials, Inc.